How did you get your start as a frame builder? I have a hard time answering this question since I first discovered frame building when I worked at a bike shop in Iowa in the early 90s. I was a mechanic for a long time but was always willing to hack into a steel frame to make it work better. The first time I picked up a torch was much later (2004) to make my first frame under the guidance of Sacha White in Portland. I had asked his opinion on how to learn to build and he suggested that I pay him to teach me (he clearly saw the chance to make some money by teaching and went for it). I always knew I wanted to break away and do my own thing. I am too driven and have my own ideas (both good and bad) about running my own business. I left his workshop wondering where to go next but I just put my head down and started bike number two and never looked back. (Bike number 2 is still being ridden every day by a good friend and bike courier in Portland) When it’s hard and I start wishing I could just go punch a time clock somewhere, I tell myself it is still worth it for some reason. I love it. I learned how to seek out my own style and build bikes because of my passion. Sacha’s said some things in passing that have stuck with me. He said that business is a game; sometimes you just need to focus on moving your piece to the next space on the board. Was it difficult, financially or otherwise, to set out on your own and start your company? It was hard and still is sometimes. There is a long running joke about how to make a million dollars in the bike industry. The punchline is to simply start with 2 million. I have worked for myself for almost a decade and don’t really know any other way to do it. I love bikes and always have and see being a frame builder as one of the most refined ways to express this passion. I pretty much had to beg, borrow, and steal to get my company off the ground. I worked as a courier all day, five days a week then would ride to the shop and build bikes until midnight or 1 am. They were long hours, but I liked it for some reason. Youth is funny that way. I eventually started to trim my work days as a courier so I could add days building bikes. Making the leap to full time was a big one for sure. To build a bike, one doesn’t need much more than a work bench, a hacksaw, a vise and some files. They take a long time to build this way but I think the learning was good. As I got bigger, I added tools and machines, but at a some point it they are diminishing returns and you can build faster with fewer tools. Is there a particular type of bike your customers ask you for more often than others? Does that match the same sorts of trends from the bike industry at-large? I build a lot of lugged bikes of all types. Being in Portland we see a lot of cyclocross bikes, but I build a number of road and city bikes with fenders, lights, rack, etc. I think most of the bigger companies in the bike industry see what the small builders do and then try to mass produce the bikes in Asia. We are on the cutting edge and build what the bigger guys can’t. Most of the builders have more passion for the craft than the rest of the bike world. This trend of mass producers following small builders is easiest to spot in the overall aesthetics like colors, parts, styles. A light brown city bike with full fenders, lights and chrome plated parts would have only been seen on a hand built bike a couple years ago, but now they are all the rage in the shops. They might look the same from 30 feet away, but the craft and detail are all clear as you get closer. It seems that city bikes are on the way out and now road bikes with full fenders and longer brakes are in. You see a lot of real year-round road bikes. I think the high-end road bikes are next but it’s only a guess. I would like to see touring bikes and city bikes come back a little but I also don’t know if they will ever really go away. Portland has a borderline-absurd number of high-end custom builders, possibly the most per-capita of anywhere in America. Does having so many builders around (ostensibly all vying for the same customer base) cause conflict ever or is it one big happy builder family? The Internet has blown the doors open with regards to the market share. 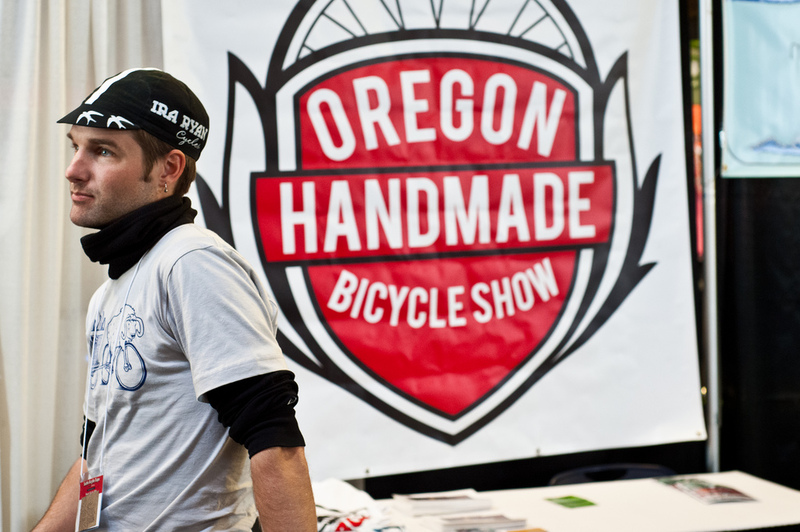 I do build some bikes locally but most of the bikes I make are for folks outside the 503 area code. While it can be hard at times and a little close for comfort, most of the Portland builders see the rising tide of hand built bikes as lifting all of our boats. Being a small town, there is a bit of gossip and such, but I try hard to remember that it’s just bikes and I need to focus on what I do best, which is build some great bicycles. You’ve entered (and won) a lot of ultra-long distance, endurance races over the years. Most people don’t understand the appeal of a self-supported race across hundreds of miles of gravel and mud like Trans Iowa. What draws you to endurance racing and riding? Exploration, adventure and a sense that you are untethered to anything at all. The feeling of riding under a full moon miles away from anyone else is pretty amazing. That same sense of adventure can be applied to road rides, mountain bikes or touring. I love them all. I also love the Trans Iowa gravel road race. I’ve won this race twice, once in 2005 and once in 2007. I grew up riding on gravel roads in Iowa and this was a great race for memories and delirium. I will always remember listening to my ipod and cruising along under a full moon. It was a race of attrition and I ended up riding away from a small group at midnight after eating two hamburgers in some small town. The gravel crunched under my tires and I turned off my light to ride by the light of the moon. I rode the race on the first frame I built. Winning on my own bike was a great feeling. This race has no prize so I scooped up a handful of gravel and put it in a jar as my trophy. Rapha’s elaborate marketing project Rapha Continental gets no shortage of criticism in the cycling world for being more style than substance, being elitist, and overusing the word “epic.” As one of the Continental riders, what’s your take on the criticism as well as the project in general? Rapha has never paid me a dime to ride or to “be epic.” I understand the sentiments of some riders towards the company, but ultimately I don’t really care. Again, I try to just do what I do and do it well. I agree the word epic is overused, but it is the reality of marketing. Rapha has been a good partner and allowed me to showcase my bikes to a wider audience. We all have to eat, right? I raced and won the Trans-Iowa long before the Rapha Conti project got started and feel a deeper connection to the style of riding that Rapha is now branding as “epic.” I think the Continental project has opened up a lot of peoples’ eyes to the roads they would normally just ride past and that’s a good thing. Rapha doesn’t own the style and I think some people feel they do. Explore! This entry was posted in Bike Industry, Frame Builders, Interviews, Messengers and tagged custom frame builder, frame building, ira ryan, rapha continental. Bookmark the permalink. This is the best interview I have read in a long time. It must be so satisfying using something you created to its full potential and winning to boot. Ira sound like a cool dude, I hope to check out some of his work in Austin. Thanks, Steven. I appreciate the comment. Have fun at NAHBS! Just finisher reading all of you interviews. I can’t believe that i have never heard of your site before. Keep up the good work.